The Mickey Most strip censorship issue As has been recorded elsewhere, J Edward Oliver was increasingly subject to censorship. There is one particular episode that was heavily censored. Here it is. As Jack recalled: I used to deliver my material to Disc very close to the deadline. When I started, Gavin Petrie suggested that I might draw a spare episode, to keep in reserve. Never got round to this, of course. Which I think was just as well - I'd have had to do a new spare episode every time the strip changed format - and I wouldn't have got paid if it hadn't been used. 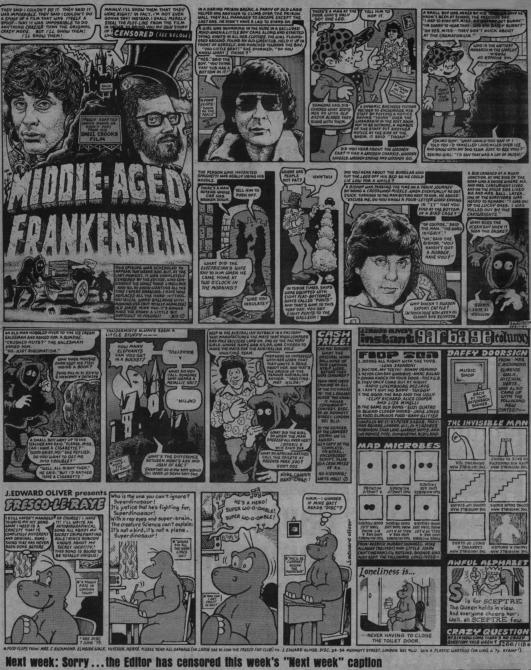 This all meant, though, that when Ray Coleman rejected the 'Middle-Aged Frankenstein' episode, I didn't have much time to come up with a replacement. The 'Fresco' strip and the Instant Garbage Column were usable, but I needed something quick to fill the main portion of the page. This is the explanation for the type-set episode (Disc, 26th July, 1975) purporting to be a novel written by Fresco: "Mike Spanner and the Case of The Seven Deadly Naked Virgin Aardvarks". In fact, I'd written this as an on-going serial letter to a female friend, a few years earlier! Nice that it finally appeared in print, though. The outcome of this saga came as a surprise to me. Despite the total censoring, Mickie Most still contacted Disc, threatening to sue! He claimed that my statement that the episode had been "completely censored by the Editor, who considered the whole thing libellous" was admitting that the episode, even as it finally appeared, was libellous! Never heard anything further, though. Learn more about this here.